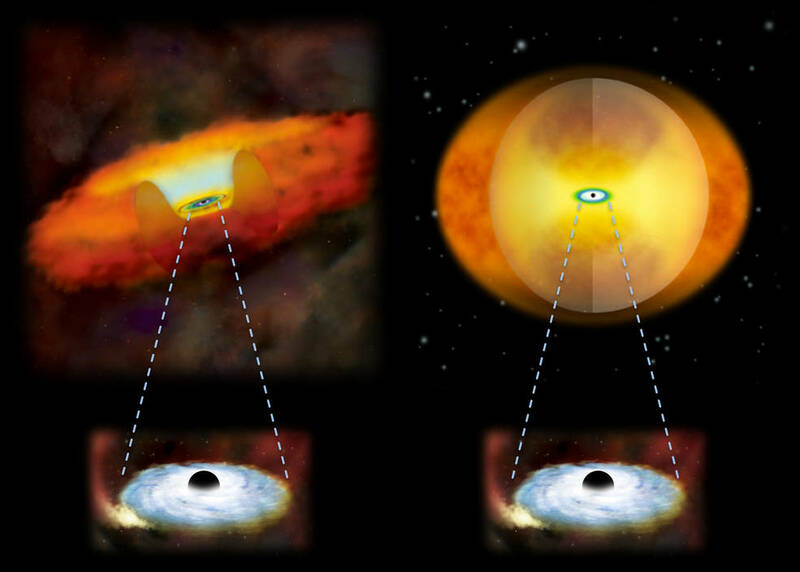 This illustration compares growing supermassive black holes in two different kinds of galaxies. A growing supermassive black hole in a normal galaxy would have a donut-shaped structure of gas and dust around it (left). In a merging galaxy, a sphere of material obscures the black hole (right). A study using NASA’s NuSTAR telescope shows that in the late stages of galaxy mergers, so much gas and dust falls toward a black hole that the extremely bright AGN is enshrouded. The combined effect of the gravity of the two galaxies slows the rotational speeds of gas and dust that would otherwise be orbiting freely. This loss of energy makes the material fall onto the black hole. The study was published in the Monthly Notices of the Royal Astronomical Society. Researchers compared NuSTAR observations of the galaxies with data from NASA’s Swift and Chandra and ESA’s XMM-Newton observatories, which look at lower energy components of the X-ray spectrum. If high-energy X-rays are detected from a galaxy, but low-energy X-rays are not, that is a sign that an AGN is heavily obscured. The study helps confirm the longstanding idea that an AGN’s black hole does most of its eating while enshrouded during the late stages of a merger. NuSTAR is a Small Explorer mission led by Caltech and managed by NASA’s Jet Propulsion Laboratory for NASA’s Science Mission Directorate in Washington. NuSTAR was developed in partnership with the Danish Technical University and the Italian Space Agency (ASI). The spacecraft was built by Orbital Sciences Corp., Dulles, Virginia. NuSTAR’s mission operations center is at UC Berkeley, and the official data archive is at NASA’s High Energy Astrophysics Science Archive Research Center. ASI provides the mission’s ground station and a mirror archive. JPL is managed by Caltech for NASA.